Top White House allies are mounting a campaign to discredit recent reports Iran will be responsible for investigating its own military facility for evidence of nuclear activities under an agreement between international inspectors and Tehran. The International Atomic Energy Agency will rely on Iran to collect its own environmental samples and turn over photos and videos from its suspected nuclear military site Parchin, according to a draft of a secret side-deal between the agency and the Iranian government published by the Associated Press on Thursday. White House allies rushed to denounce the report, accusing the AP of publishing a phony document and suggesting that the Israeli government forged it to undermine the Obama administration’s Iran deal. J Street, one of a number of groups that has been meeting with White House officials as part of a lobbying push to support the nuclear deal, questioned the accuracy of the document obtained by the AP on Friday and suggested that it was forged by Israel. "The AP report should be thoroughly investigated and verified," J Street tweeted. "Very worrying if there is any doubt of authenticity." Obama administration officials and the IAEA have not disputed the authenticity of the document. The existence of the Parchin side deal was first mentioned publicly by Sen. James Risch (R., Idaho) at a Senate Foreign Relations Committee hearing last month. Trita Parsi, the head the National Iranian American Council (NIAC), another White House-allied group, hinted that Israeli President Benjamin Netanyahu might have forged the document himself. Parsi noted that the draft document published by AP referred to the "Islamic State of Iran" in one instance, instead of the "Islamic Republic of Iran." "The only one who refers to Iran as ‘Islamic State of Iran’ is Netanyahu. And strangely, @AP‘s dubious ‘draft’ of the IAEA-Iran agreement…" wrote Parsi on Twitter. Others also floated the idea that Israel fabricated the document and leaked it to the AP. "Could it be that #Israel stands behind leaking this document to #AP?" tweeted Said Arikat, the Washington bureau chief for Al Quds daily newspaper. Jeffrey Lewis, a professor at the Middlebury Institute of International Studies at Monterey (MIIS) who tweets under the name ArmsControlWonk, also questioned the accuracy of the report on Twitter. MIIS, J Street, and NIAC have all received funding from the Ploughshares Fund, one of the top financers of the lobbying campaign to support the Iran deal. The pushback against the AP story, and insinuations about Israeli sabotage, follow a months-long campaign to discredit Jewish lawmakers and others who have announced their opposition to the deal. These attacks include charges of "dual loyalty" against Jewish politicians, which pro-Israel groups said crossed the line into anti-Semitism. Vox blogger Max Fisher also argued that the AP story was "badly flawed," noting that an ex-IAEA official questioned its authenticity and that some details were removed from the story after it was posted. The AP later added those details back into the article and said it had been shorted for brevity and not due to accuracy issues. "As with many AP stories, indeed with wire stories generally, some details are later trimmed to make room for fresh info so that multiple so-called ‘writethrus' of a story will move on the AP wire as the hours pass," AP spokesperson Paul Colford told Fisher. "It was unfortunate that some assumed (incorrectly) that AP was backing off." AP reporters noted that the Obama administration and the IAEA have not disputed the document’s authenticity. "If you don't want to believe the report, so be it. But I would look for someone to actually deny what's in it," said AP diplomatic reporter Matt Lee in a tweet to Fisher. "I am curious if you have managed to find a current official anywhere to back up the fraud claim," Lee later added. As of Friday afternoon, Fisher had not. The original AP article was written by Vienna bureau chief George Jahn. According to the report, a draft of a side deal between the IAEA and Iran would allow the Iranian government to police its own military site for nuclear activities. Iran has been accused of conducting nuclear detonations testing at the Parchin military facility, and supporters of the nuclear agreement said the site would be opened to international inspectors under the deal. 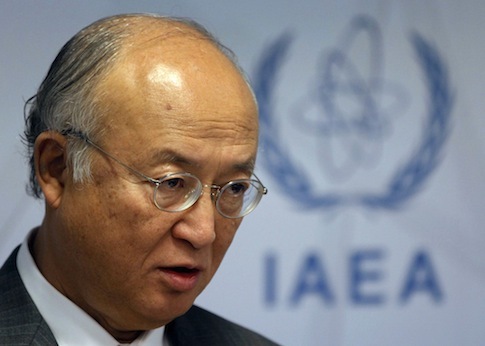 But according to the AP, the IAEA side agreement would not allow independent inspections of Parchin. Instead the Iranian government would turn over photographs and videos of the military site to the IAEA. Under the deal, Iran would collect its own environmental samples from the Parchin military facility, which international inspectors would then test for nuclear residue. Iran has been accused of conducting nuclear detonations testing at Parchin, and supporters of the nuclear deal said the facility would be opened to international inspectors under the recently signed agreement. This entry was posted in National Security and tagged Associated Press, Iran, Iran Nuclear Deal, J Street. Bookmark the permalink.